Your participation in a Library program entitles the Baldwin Public Library to use photos for publicity purposes on our website, newsletter or newspaper releases. 9:30 - 10:30AM | Thursdays, March 7, 14, 21, 28, April 11, 18, 25, & May 2. Learn to communicate with your baby. This program blends American Sign Language vocabulary, music, & play. Registration begins Monday, February 4. Join us for a step-by-step painting class. Each child will bring home their own painting on canvas. Materials will be provided by the library. Bring blankets, pillows, sleeping bags, and whatever will make you cozy as we set up the carpets and watch a movie on the big screen. A light snack will be provided. Huston wrote and directed the adaptation of Dashiell Hammett’s novel The Maltese Falcon, featuring the hard boiled detective Sam Spade, as portrayed by Humphrey Bogart, in this film noir classic. Huston’s first film hosts a whimsically sinister ensemble cast featuring Mary Astor, Peter Lorre, Sidney Greenstreet, and Elisha Cook, Jr. Discussion led by Christopher Woods. Refreshments will be served. Registration begins Thursday, March 28. For all those who like to knit or crochet. Advanced beginners and beyond are welcome. Bring a mah-jongg card and set. If you have a chronic illness, join this group to share your journey with others, find resources, and learn how to live better. The National Student Loan Service will present information about current programs that offer loan consolidation and other assistance. Help your child get ready to read by enhancing their early literacy skills with stories, songs, fingerplays, and a craft. Registration begins Monday, April 8. Teens in Grades 6 - 12. All you need is some comfy clothing, a yoga mat or towel and a water bottle. Attention! Teens in grades 6-12, would you like to have a voice when it comes to teen services @ your library? Join TAG, “Teen Advisory Group,” and be a part of the changes. Talk about topics that concern teens, programs, library materials, and a lot more. We want to hear your ideas and opinions! Keep a record of your hours of participation so you can use it to help fulfill your community service requirements for school. Donna Miller-Small will teach attendees the game. In-person registration begins Monday, March 25 (non-residents 4/1)*. Cardio exercise dance class; no dancing experience required. Waiver required. In-person registration begins Monday, April 1. (non-residents 4/8)*. Come join us for a game of chess. There will be plenty of snacks for everyone. Decorate a craft for mom or grandma for Mother’s Day! Children of all skill levels- join us for a chess workshop. Can’t make both sessions? Sign up for each session individually. Concert: The N.Y. Trio & Co.
Get ready to enjoy classic rock tunes performed in a fun way. Free tickets available starting Monday, April 1. Designed for active older adults, beginners, or those with physical limitations. Dance to great music. Suitable for all ages & fitness levels. Chair replaces the yoga mat. Instructor is Jill Ackiron-Moses. In-person registration begins Monday, April 1 (non-residents 4/8)*. Participants will be taught how to carve roses from delicious strawberries, attach stems and wrap them in cellophane. There will also be demonstrations on how to carve other fruit into decorative items. Nobel-prize winning playwright O’Neill’s tour de force is an American classic of modern theatre. The play explores the universal themes of the need for hope against the realities of despair, as well as the passions of love, family, friendship, politics, and ultimately, survival. Playtime and circle time for tots. Professionals (speech pathologist, social worker, dietician, etc.) informally meet with parents/caregivers and answer questions. Judy Garland’s career spanned decades from childhood through adulthood with many successes and hardships along the way. This two-part series delves into the life of this incredibly interesting performer. Stories, songs, fingerplays, and a craft with a bedtime theme. Learn how to make chocolate covered strawberry hearts using only 3 ingredients. Wednesday, May 8, 8:30PM at the BUFSD District Office located at 960 Hastings Street. For voter and absentee ballot information, call the District Clerk’s Office at (516) 434 - 6011. Residents may register to vote until May 16th at the BUFSD District Office. Songs, fingerplays, and play time for babies. Join us for a bunch of activities focused on sensory development. The Library will be CLOSED today in observance of Mother's Day. The Library will reopen tomorrow, Monday, May 13th at 9:00 AM. Participants should be in good health. Waiver required. Instructor is Veronica Raehse. In-person registration begins Monday, April 15. (non-residents 4/22)*. Designed for drivers age 50 and over, for insurance and/or points reduction. Fees are $20.00 for AARP members with a valid membership card; $25.00 for non-members. No cash. Register at the Adult Reference Desk. At registration, bring one check or money order per person payable to AARP. Tuesdays, May 14 and 21, 5:45PM-8:45PM In-person registration begins Monday, April 8 (non-residents 4/15)*. An options counselor from the Office for the Aging will be available to answer questions. Zumba is a fitness activity based on Latin dance moves. These moves are easy to follow, repetitive, fun, and set to fabulous upbeat Latin and popular music. All you need is some comfy clothing, sneakers and a water bottle. The Library is under the authority of a five-member Board of Trustees. One member is elected each year at the annual election in May. The term of office is five years. The library budget is proposed by the Board and is voted upon by the residents. The Board of Trustees generally meets on the third Wednesday of each month at 7:00pm at the Library. Please call the Library at 516-223-6228 to confirm the time, date and room. Three sessions each of Bellyfit Sage™- a class designed for active older women seeking a gentler form of movement using belly dance, hula, international & fitness inspired moves as well as elements of Chair Yoga AND Zumba® Gold Toning – which blends Zumba® with a redefining total body workout using Zumba® Toning Sticks or 1 lb. weights to add intensity. In-person registration begins Friday, March 29. (non-residents 4/5)*. Stories, songs, fingerplays, and a craft. Celebrate the 200th birthday of Long Island's Walt Whitman. Facilitator Christopher Woods will lead a discussion on Walt Whitman’s poetry. The group will read selected poetry at home and discuss his writings. Refreshments will be served. Registration begins on Monday, April 22. There will be one vacancy on the Library’s Board of Trustees, for a term of five years to expire June 30, 2024. Library Trustee Joseph Carroll is seeking re-election. Copies of the 2019-2020 Proposed Library Budget and Trustees’ Message may be obtained at the Adult Reference Desk or on the Library’s website, www.baldwinpl.org. Informatión sobre el presupuesto está disponsible en el sitio web en español. Take a one hour tour of this magnificent Gold Coast mansion resting majestically on the highest point of Long Island. Enjoy lunch at a nearby Italian restaurant. Then it's on to celebrate Walt Whitman's 200th birthday with a one and one-half hour guided tour of Walt Whitman's home by Walt himself! In-person registration for residents begins Monday, April 1 (nonresidents 4/8)*. Read the book then come watch the movie. Discussion will follow at the end of the movie. Your voices matter, your dreams matter, your lives matter. The Library will be CLOSED today in observance of Memorial Day Weekend. The Library will reopen on, Tuesday, May 28th at 9:00 AM. Support your library and march with us. Registration begins Monday, May 6. Join Lois T. Martin, Psychic Numerologist, in understanding what popular numerical signs mean. The showing of numbers is an attention getter from the upper elevations that are not from loved ones only, but also from angels, master ascendants, spirit guides, etc. Resident registration begins Monday, April 22 (nonresidents 4/29)*. Join the Friends of the Library as they present their inaugural event – a morning with local romance novelist Renee Daniel Flagler. Ms. Flagler is an award-winning writer, adjunct professor, and speaker who is passionate about encouraging people, especially women and youth, to pursue their passion and purpose. Her books include Society Wives and the Chandler Legacy series (as Nicki Night). Ms. Flagler will discuss her writing process and read from her work. Free tickets will be available at the Reference Desk beginning May 6. Information about purchasing Ms. Flagler’s books will also be available. All proceeds will benefit the Friends of the Library. Discussion leader: Programming Librarian Marialisa Arnold. 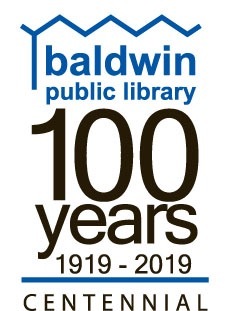 The Baldwin Public Library is turning 100 years old in October (don’t we look great for our age?). We know you’ll want to join us on the evening of Saturday, October 5 for our Centennial Gala, and we’ll have an afternoon of family fun on Saturday, October 19. Details about both events are coming soon. Until then, we’ll be counting down to October with our Decades movie series. On the first Friday of each month from June through September, we’ll screen a film that is emblematic of America life and cinema from the 1920s through the 1980s. All movies will begin at 2:00PM. Movie candies will be available for purchase; all proceeds will benefit the Friends of the Library. Open to all drivers, can be used to reduce your auto insurance and/ or points. Fee: $35. No cash. Make checks or money orders payable to Martin Hirschfield. Decorate a gift and card for dad for Father’s Day. Registration begins Monday, May 13.